Michelle's Large Family Living (Angel Wings Homeschool): Groupon Sale on Shakespeare..
Groupon is having a great sale on Shakespeare Childrens books. From Hamlet to King Lear to Romeo and Juliet, the books collected in the Shakespeare Children’s Story set introduce kids to some of the most revered works in the Western literary canon. Each selected play is rewritten in narrative form to make it easier for young ones to follow, and in the process complicated plots are simplified and made suitable for young children. Accompanying illustrations further engage readers. 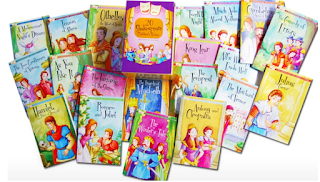 The set of 20 books helps kids build their reading skills, nurtures their love of literature, and weakens their interest in becoming a corrupt king or queen.